Well today guys it was a beautiful spring day, I lit the acorn up at 7 a.m.
And did a few practice runs! I did a porterhouse steak for lunch as well turned out very nice! So today's 2 questions I got the temperature up really high around the 500s then I tried to back it right down to low and slow, and that took almost an hour! Should I have shut the thing down completely and then re lit? And pizzas I've been watching on YouTube. Some people say put the deflector plate in and put the pizza plate on the grill! Other videos say take the deflector plate out and put the pizza rack on the top swing arm! And pizza temperatures videos range from 400 500 to 700. What is the most common pizza temperature? Power wrote: Well today guys it was a beautiful spring day, I lit the acorn up at 7 a.m.
Congrats on your great porterhouse cook ! As for backing down ur temps, u might not have seen my post burried in one of ur threads but what I mentioned was once ur at high temps it's not that easy to lower them as u might think. To go from searing steaks to smoking temps really isn't realistic lol. That cooker is insulated very well and retains the heat so in order to get the heat down u need to do a few things. First, back both vents down about 75%, not completely. U don't want to snuff the fire completely. Then, u need to ( burp ) it by opening it slowly but most of the way to let the heat escape. Don't keep it open too long because at this same time ur flooding the coals with oxygen and basically stoking the fire as well. But, ur letting heat out and eventually after half a dozen times or so the temp will drop considerably. Then work ur vents for lower temps. As for pizza, the ONLY way to properly do one is to make sure ur fire bowl is pretty full and light 4 or so spots on the coals. 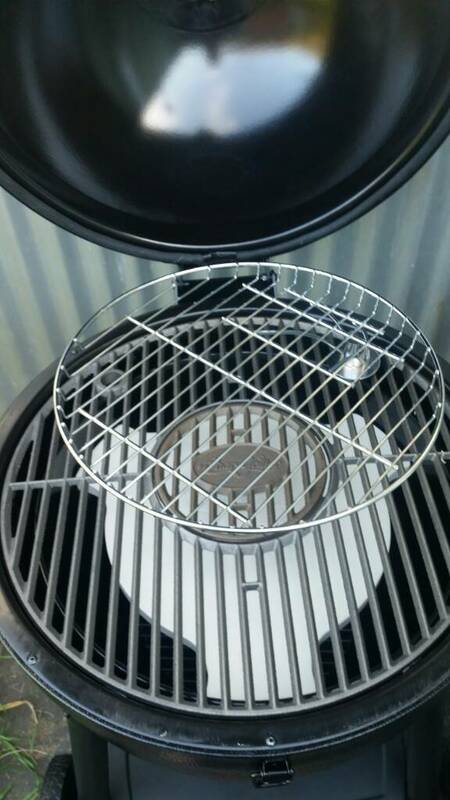 Open both vents fully open, put the cast grate on and then the pizza stone/smoking stone on TOP of the cast grate, never ever under the grate, that placement is ONLY for low n slow cooks.Remember, that oddly shaped stone you have is dual purpose. Its meant as a deflector in the lower position ( set on the 3 tabs in the fire bowl ) and as a pizza stone up top on top of the cast cooking grate. That stainless rack that swivels is more a less a warming rack or a place to put buns and rolls. U can also cook ur food on it I suppose, but ur better off using ur grate for that. Make sure ur stone is in as soon as u get the coals lit. You never want to ( shock ) ur stone with high heat, it will crack. After u get to about 300 or so, start backing both vents to half way and WAIT 15 minutes for the temp to stabilize. If it's not up to 550/600 do little adjustments and WAIT again. Eventually u will lock ur pizza temps in. U want to do pizzas at about 550/600. I've done them at 700 and it seems to be too hot. Also, make sure u put a dusting of Semolina on your stone just before u put ur pizza on. It will take between 7 and 10 minutes for one of the best pizzas you will ever have. P.s, when prepping ur pizza, dust ur cookie sheet with Semolina before you lay ur dough on it. It will make it slide onto ur stone a lot easier. Make sure ur stone is hot when u put ur pizza on It. A lot of people prep the pizza on the stone inside the house and then put it on the grill. That is a big no no..
U want ur stone at temp before u slide ur pizza on It. Try not to take too long for that step because if that lid is open, ur stoking the fire and raising the temps. Good luck and post some pics for us all.. Cheers thanks for that! So are you saying to put the oddly shaped deflector on top of the cast grill, then put a pizza stone/tray on the deflector or cook the pizza on the deflector? Power wrote: Cheers thanks for that! So are you saying to put the oddly shaped deflector on top of the cast grill, then put a pizza stone/tray on the deflector or cook the pizza on the deflector? The char griller pizza stone that you have is round with 3 tabs right ? If that's what you have, that's the ONLY thing you need. That is a pizza stone AND deflector aka smoking stone. You shouldn't have any other type of stone or deflector. Can u post a pic of what you have ? Check my other post, it shows you what you should be using.